Welcome to a new world of comfort and convenience. Etihad flights to Abu Dhabi three times daily from London Heathrow and a twice-daily service from Manchester, with more than 90 destinations beyond - across the Middle East, Americas, Africa, Australia and Asia. 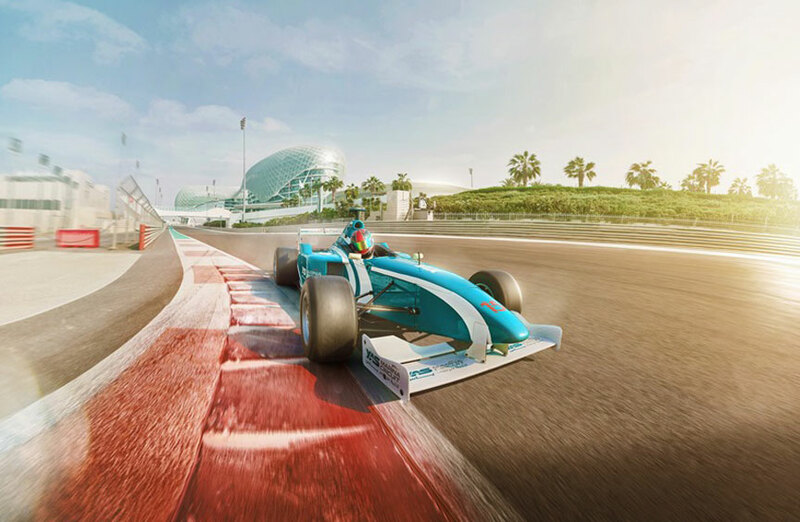 Plus, book with Etihad Airways and enjoy a world of fun with The Extraordinary Abu Dhabi Pass. The wide ergonomically designed seats allow you to relax in spacious surroundings. To make sure you are kept refreshed throughout your flight, Etihad Airways offers a great range of food and beverages, along with a three course meal. 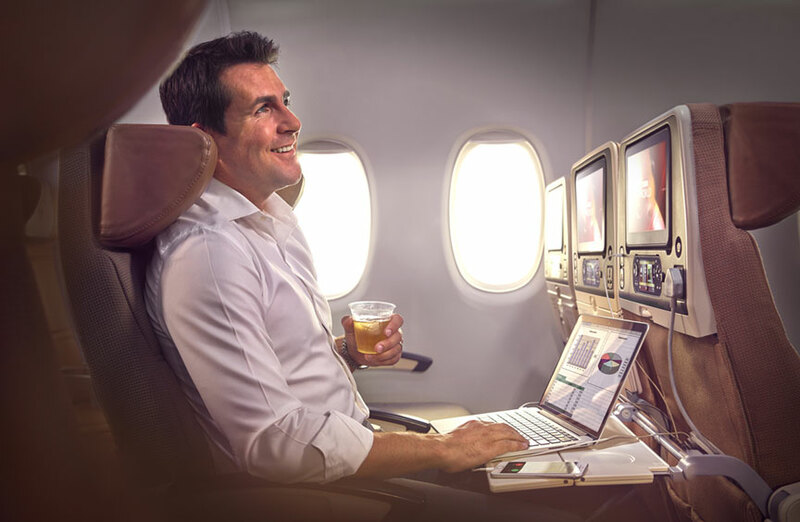 Onboard every Etihad Airways flight you will have access to a personal in-flight entertainment system with hundreds of hours of blockbuster movies, television shows and games to choose from. 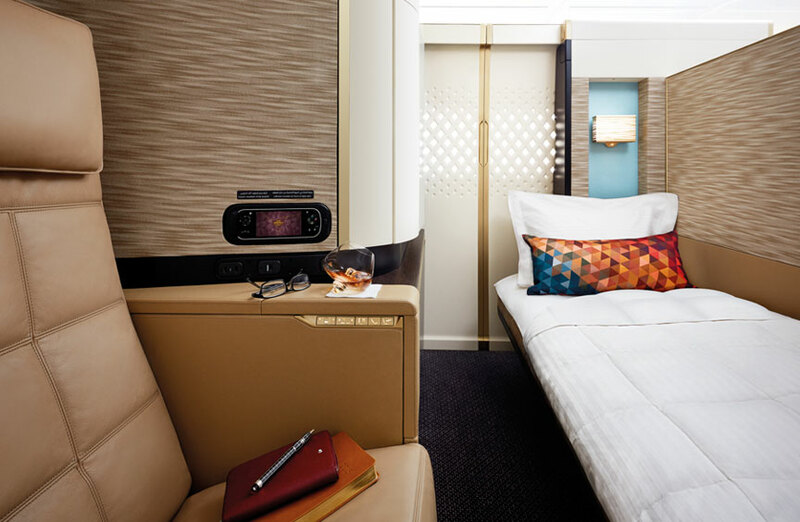 Etihad Airways Business Class offers a fully flat bed so you can comfortably stretch out in your spacious surroundings. As well as a bigger seat pitch you can also enjoy the flexibility of adjustable head rests, foot rests and lumbar support. When you book a flight with Etihad Airways Business Class you will experience 5-star dining from the Kitchen Anytime menu. Relax in the Business Class lounge in Abu Dhabi, unwind in the Six Senses Spa and enjoy 5-star dining. Flying in Business Class gives you access to a private chauffeur service in Abu Dhabi for two one-way transfers. 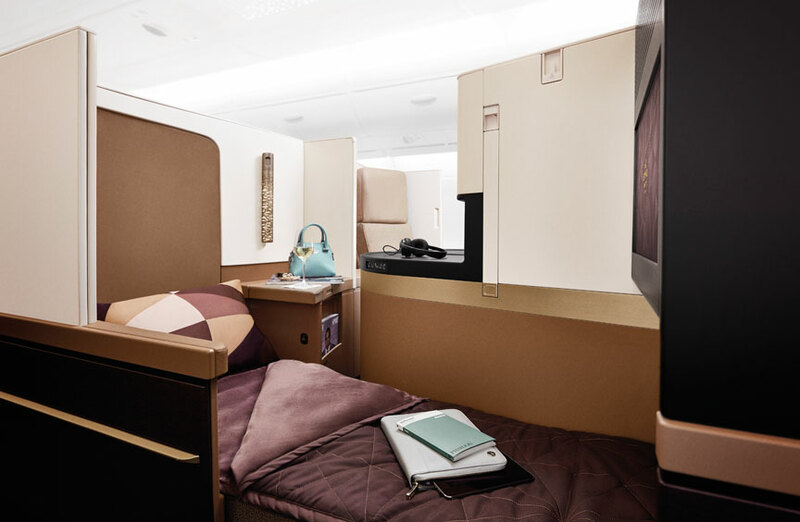 Sit back and relax in luxurious, comfortable and spacious surroundings onboard an Etihad Airways First Class flight. The comfortable seat transforms into a relaxing flat bed from a touch of a button. As well as an adjustable head rest, leg rest and lumbar support the first class seating also boasts an inbuilt massager. A First Class flight includes a 23-inch personal screen, in seat power adaptors, including iPods and USB docks, face to face dining and personal mini bar. Relax in the First Class lounge in Abu Dhabi and unwind in the Six Senses Spa. Etihad have teamed up with some of Abu Dhabi's best attractions, restaurants, spas, beaches and much more to give you the Abu Dhabi Extraordinary Pass. Simply show your boarding pass at the participating retailer and enjoy a world of savings, it's as easy as that! Enjoy money off at top stores and special gifts at The Galleria on Al Maryah Island. 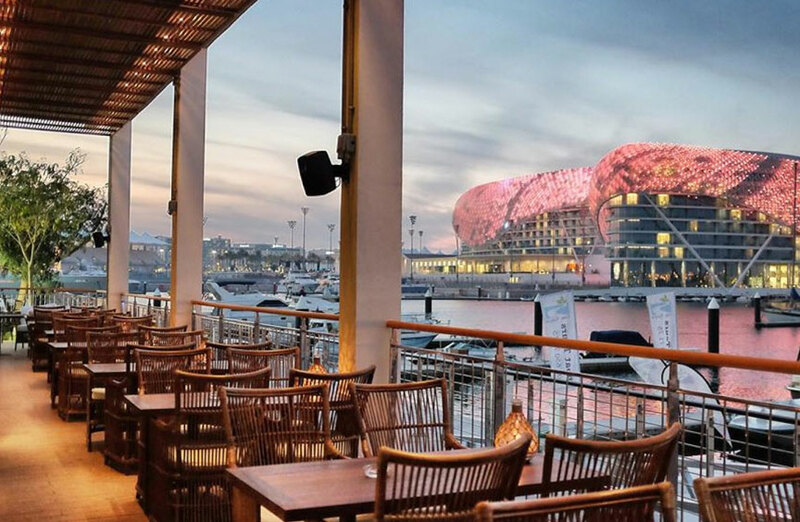 Dine like a king with money off a wide selection of restaurants in and around Abu Dhabi. 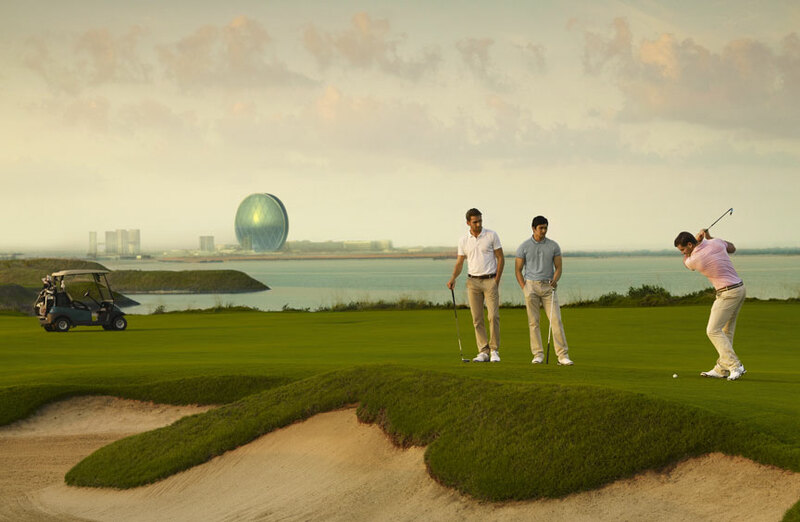 If golfing's your game, 2 for 1 and discounted green fees will hit the tee. With savings of up to 50%, visit some of the best attractions that Abu Dhabi has to offer, at the best price! 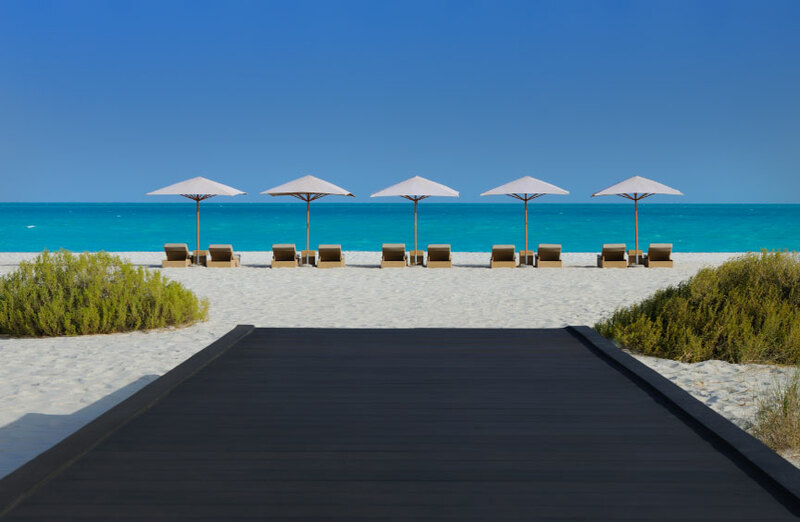 Sit back and relax on the best beaches in Abu Dhabi knowing that you’ve got a great deal – save 10%. Let the treatments in many of the top spas in Abu Dhabi sooth your soul with discounts of up to 20%.